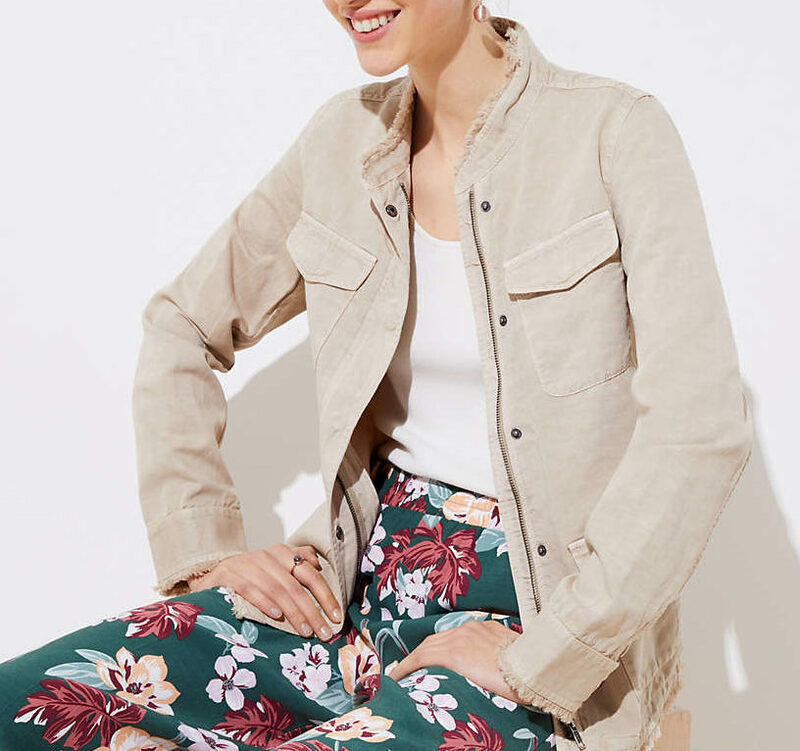 There are a few things I like about Ann Taylor’s little sister: first off, they’re really reasonably priced, and seem to forever be offering everything at 40% off. They stock most of their clothes in petite sizes. And they recently added extended sizes too. You have to forage a bit to get to the good stuff, but it’s there: this shirt jacket, for instance, is a very nearly perfect spring layer. 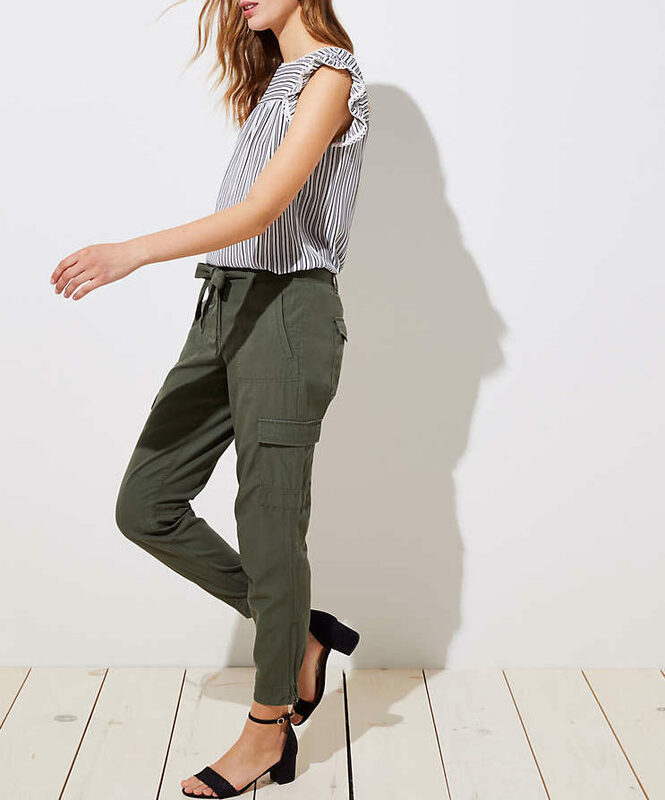 And these cargo pants are totally cute with the waist-tie. An eyelet top for kicking around in all summer. From the extended sizes department: a black dress that could easily be dressed way up or down. 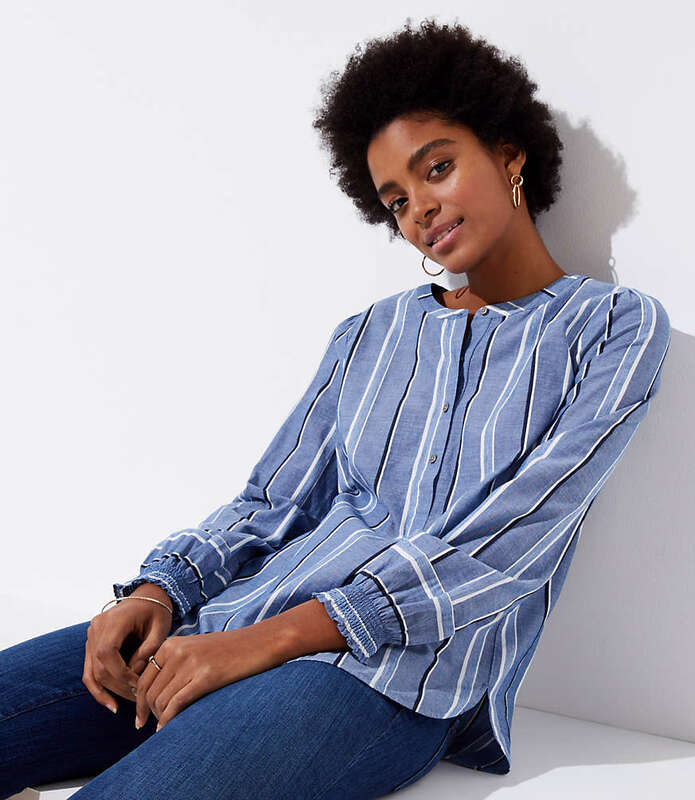 A really crisp striped popover. This swing utility jacket looks just like one from The Great that goes for a whole lot more cash. 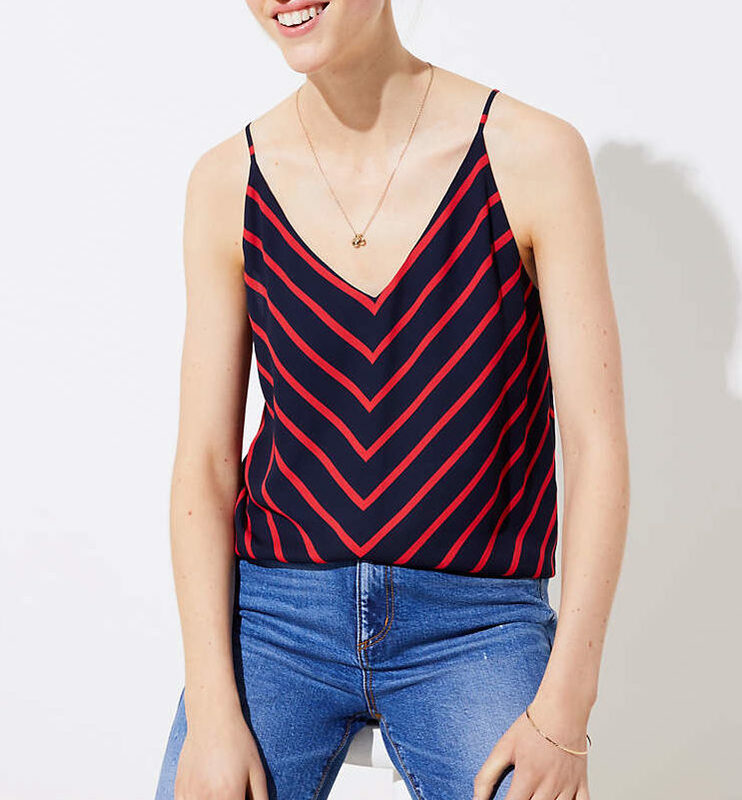 I love this Chevron-striped cami, and would wear it under a blazer. 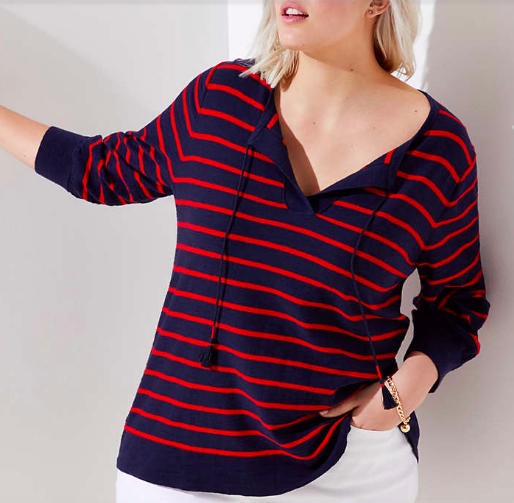 Such an adorable beachy/preppy sweater. The gatherings on this tank make it so feminine. This linen tee looks like the ones Isabel Marant makes. Plus, it’s yellow. A striped boatneck sweater is so clean-lined, and versatile too. Every now and again, I find the prettiest tops from Loft. Adding those cargo pants to the list of things-for-me-to-try-on-when-I’m-shopping-for-my-Muther-at-the-mall. Also love that linen tee! Adding those cargo pants to the list of things-for-me-to-try-on-when-I'm-shopping-for-my-Muther-at-the-mall. Also love that linen tee! I shop at LOFT a decent amount because it suits my budget and has some good pieces. I will say two negatives about them: often their clothing has too many details ( a cute pair of pants with an awful buckle on them and the like) and their “deals” change so frequently that you could buy something on day at 40% off and the next day it’s 50, which is frustrating. Save receipts. I shop at LOFT a decent amount because it suits my budget and has some good pieces. I will say two negatives about them: often their clothing has too many details ( a cute pair of pants with an awful buckle on them and the like) and their "deals" change so frequently that you could buy something on day at 40% off and the next day it's 50, which is frustrating. Save receipts. Thank you so much for posting the cranberry utility jacket! I’ve been eyeing the similar one from The Great for some time but could never justify the purchase. This will give me a chance to try the style out before committing to a much bigger expense. P.S. I haven’t commented previously, but I have been enjoying Girls of a Certain Age for years – and, before that, Lucky. I am looking forward to your book! Thank you so much for posting the cranberry utility jacket! I've been eyeing the similar one from The Great for some time but could never justify the purchase. This will give me a chance to try the style out before committing to a much bigger expense. P.S. I haven't commented previously, but I have been enjoying Girls of a Certain Age for years - and, before that, Lucky. I am looking forward to your book! Loft does have cute stuff sometimes, and their supply changes frequently. A warning – their sizes notoriously run large. Loft does have cute stuff sometimes, and their supply changes frequently. A warning - their sizes notoriously run large. Beware shopping both Ann Taylor and Loft online. Their shipping/returns are SLOW, SLOW, SLOW. So many online retailers are so good at this now — it really irks when others are not. Beware shopping both Ann Taylor and Loft online. Their shipping/returns are SLOW, SLOW, SLOW. So many online retailers are so good at this now -- it really irks when others are not. Thank you for including Loft in your picks this week! I’m kind of in love with the military style jacket in the first picture (in the olive color.) Looks like it could be Vince. It’s nice to find that style without a drawstring waist or too many other bells and whistles. Just a great, wearable basic. I'm kind of in love with the military style jacket in the first picture (in the olive color.) Looks like it could be Vince. It's nice to find that style without a drawstring waist or too many other bells and whistles. Just a great, wearable basic. Love the side button skirt with the striped sweater. Any problem with a 52 year-old size 6 wearing it with flats? Didn’t think so! Love the side button skirt with the striped sweater. Any problem with a 52 year-old size 6 wearing it with flats? Didn't think so! The cargos are on my list! I’ve been looking forever and they are cute plus the price is right!